The City of Converse has a new stormwater program that is mandated by the Texas Commission on Environmental Quality (TCEQ). Stormwater Operations is responsible for drainage control and maintenance for flood prevention in Converse. The department works with the Street Department to provide comprehensive, efficient, and effective stormwater management. The street cleaning crew sweeps city streets on a planned schedule in order to help prevent debris from building up on curbs and causing potential drainage problems. Drainage maintenance and debris removal is important for flood control. Regraded work is being done in some creeks to ensure proper water flow. The city will also began programs in the future for citizens and organizations to learn about and help with the beautification of our city. The main goal of Stormwater Operations is to have a safe and healthy city for its citizens and the environment. Report any Drainage, Erosion or Illicit Discharge Problem. Call (210) 658-3453 or after hours contact the Converse Police Department Dispatch at (210) 658-2322. 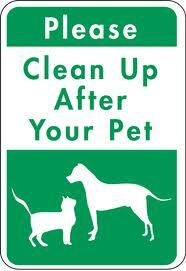 Dog and cat waste left on the ground is more than smelly and unsightly, it pollutes our water and poses a health risk for pets and people, especially children. Please, always remember to scoop the poop and dispose of it properly. For more information, please contact Stormwater Inspector Larry Moxley at (210) 658-3453.